(CNN) – Rep. James Clyburn, the House assistant Democratic leader, claimed Wednesday that some sectors of the news media were complicit in spreading misinformation, and used an historical example from Nazi Germany to illustrate his point. According to The Hill newspaper, the South Carolina Democrat said "manufactured controversies" were becoming more common with the rise of internet journalism. "You have people's words and phrases being misrepresented and looped through the news media and thrown out there on the Internet, and people run with it because these things start getting reported in the mainstream media, and before you know it, people believe that stuff," Clyburn said on a Sirius XM radio program, according to The Hill. Later, he noted that during the Third Reich, media propaganda was used to broadcast the ideas of the Nazi regime. "The people of Germany believed Hitler's foolishness that led to the Holocaust. 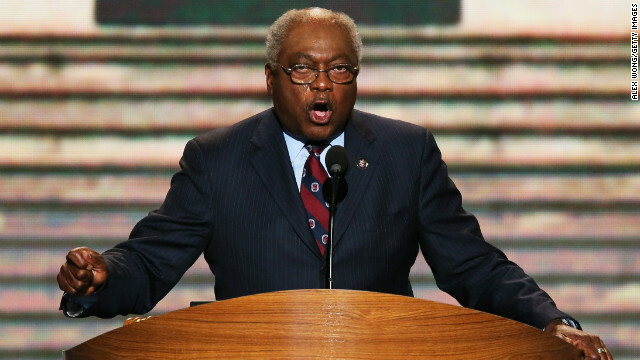 They believed that stuff," Clyburn said. "People will tend to believe what they hear through the media." The Hill noted that Clyburn spoke specifically about "extreme right-wing" bloggers during his interview, asserting those within the conservative blogosphere had forced former Department of Agriculture employee Shirley Sherrod from her post using misinformation. "Most of these people are not media people; they are bloggers, and they are bloggers for the extreme right wing," he said. He's right. Of course, now the MSM will take his statements and do to them exactly what he just described. Oh look...nice headline, CNN. is what the Tea Party does, but I do think he is saying what most are afraid to. all I get, and that is enough. That's laughable.........Obama is controlling the mainstream network media......all of them to some degree, including Fox News, and Dems are literally controlling what people see and hear........in the mainstream media. To have a Dem try to say the other side is publishing stuff that isn't true........is as laughable as it gets. It is true.......that Hitler used the media to his advantage by controlling it.......but then that's what Obama does NOW! The best way to find out truth, is to go off shore, to other media. Even then, Cameron is allowing Obama to exercise some control of U.S. news, in the BBC. Truer words were never spoken sir. I'm still waiting to see an article where the MSM calls the GOP out on their blatant hypocrisy in regards to President Obama and the Canadian Senor Cruz. Nothing but crickets. I've seen one interview and it was on CBC. I have often thought of what kind of scenario would allow another person like Hitler to come to power. I have concluded that person (or group) would first have to have a press (news media) who would act as a mouthpiece for the government and abdicate their journalistic duty to hold the government accountable. Unfortunately, this exact apparatus has been in place in the United States since 2008. With the exception of earlier this year in regard to the NSA, AP, IRS and some other issues, the mainstream media has been as extension of the White House press office. Calm down, I am not insinuating by any means that Obama is Hitler. However, unless things change drastically, one day somebody is going to come along, get in to power and it will be too late to to stop them. If Rep. Clyburn doesn't like an opposing point of view he should either get used to it or resign. Chewing on his behind and the behinds of other politicians from other political parties is what the news media is supposed to do. Just like they did with Nixon on Watergate. Just say it James ......FOXPAC. They lie and they don't care. "Cameron is allowing Obama to exercise some control of U.S. news, in the BBC." Godwin's Law: this twerp loses.
" Unfortunately, this exact apparatus has been in place in the United States since 2008. " Really? After all the verified reports that Bush did things like hand out the questions he wanted asked at press conferences (something that has not been reported about Obama) and incidents like the NYT helping sell the "weapons of mass destruction" lies to get us into Iraq or helping out Valerie Plame, you have the audacity to claim it all mysteriously began in 2008? After all the proof people have piled up that Faux News is literally lying to its audience on a regular basis, that people who watch it are MORE MISINFORMED AND UNDERINFORMED than people who don't watch ANY "news", and the undeniable truth that they are by far and away the most ridiculously biased pile of crap that's ever been allowed to enjoy the label of "news network"...you still happily engage in the delusional parroting of right wing propaganda about the existence of a "liberal media"? It's laughable. All you're doing is expressing your frustration that reality isn't what you'd rather it be and that people in the MSM are reporting it anyway, instead of telling you comforting bedtime stories and fairy tales like they do on Faux News. Stop whining and get real. The GOP is not surviving the next couple of decades simply by suppressing enough votes, preventing immigration reform and insisting that the MSM start reporting their version of reality "or else." Not happening. "Chewing on his behind and the behinds of other politicians from other political parties is what the news media is supposed to do"
Uncritically running with stories of counter-factual conspiracy theories from people like the birthers, all while never bothering to report on the law that showed they couldn't possible be right and the facts that showed they absolutely weren't right...that's not "chewing on someone's behind." That's falling for the right wing propaganda trick of throwing red meat at the MSM, who they know will run with such easily sensationalized controversy nonsense, and desperately handle it with kid gloves lest they be accused of failing to be "fair and balanced"...wrapping it all in a false legitimacy for fear that disproving it too succinctly and truthfully will (a) lose them potential revenue and (b) generate more RWNJ accusations of liberal bias. Yes, we know exactly why the right is constantly howling about liberal bias, and yes, we know that it's specifically designed to create a general rallying cry among conservatives that makes objective journalists fearful of being "too objective." @Rick McDaniel,you're delushional bud as always thinking Pres.Obama,democrates control the media,try watching that conservative trash show you call FAUX or is your head still stuck up in your nether regions..And Rick you have no idea about anything about the Hitler regime and how Joseph Goebbels Hitlers propaganda specialist kept feeding the ignorents of Germany like you republicans are being fed by the likes of Limbaugh,Hannity,Boehner and McConnell..Those are the ones the other partys worry about because you follow those of a dangerous delushional kind , the ones who thinks they're intelligent in which they're not!! We all know the GOP is the new nazi party in America , but you will lose the next several elections like you have been doing sence bush , your done!!!! !in 2014 midterms. He's talking about the fox dopes channel, only dopes in the GOP watch it !!!!!! I watch all three cable news stations so I can hear all sides. Tell me what does fox news lie about? That`s all liberals cry, but they never actually say what they are lying about. The problem is not the bloggers but the main stream journalist who spend whole day blogging later in the evening runs to broadcast what they have been blogging during the day. The worst culprit being msnbc queen. So mr clyburn first do your homework and leave alone those bloggers with no agenda to exercise their first amendment rights. The rabid right know their base is stupid enough to hear anything they hear loud enough and often enough. they have no compunctions about outright lying to suit their purposes. and these are supposed to be the 'Good Christians?' yeah, right! Get your facts straight Mr. "Clyburn rips media by harkening back to Nazis" the problem is with both "extreme right-wing" bloggers and 'EXTREME left wing blogger" who masquerade as bloggers during the day and main stream reporters during the evening news and don't look no farther than that useless msnbc queen of manipulation. The problem is not only disinformation but peoples attention span . Another idiot in my party that wants to silence the 1st Amendment. The irony is that its our govt that is acting like the Nazis. Both major parties are a corrupt cancer upon the country. They should ALL be removed from office. He's right. The news a lot of Americans get are the lies from limburger, insanity and his faux news cohorts. Not only are they lies but they are crazy thoughts to make the President and his administration look bad without anything to back them up. Birthers example, Obama born to an American mother/Kenyan father in our 50th state of Hawaii vs the crazy Canadian/Cuban/American born to an American mother IN CANADA and a still Cuban national but there are crickets on the right wing media and the trumpeter about rafael Edward cruz being able to run for president and Obama couldn't. Even chris satthews has lot all sense. He is running scared and continues to spew that the mr. 50's/60s cold war wannabe prime minister of Canada (his birth country) is an American. He is NOT!